Champney was born in New Ipswich, New Hampshire. He first visited Conway in 1838. 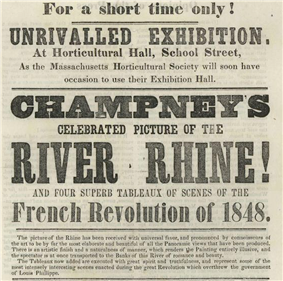 In 1841, Champney went to France to study, returning to Boston in 1846, and then returned to Europe almost at once to paint a panorama of the Rhine River. He returned to Boston in 1848 and exhibited the panorama there in December. It was subsequently exhibited in Worcester, Massachusetts, New Haven, Connecticut, and New York City. 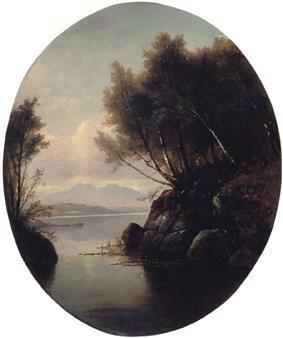 In 1854, he went on a painting trip to Germany and Switzerland with John Frederick Kensett. The panorama, unfortunately, was destroyed by fire in New York City in October 1857. 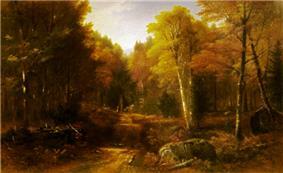 In 1850, Champney returned to the White Mountains with his friend, Kensett. 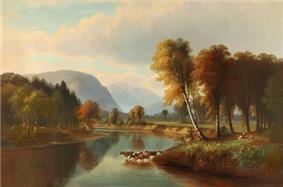 Their enthusiasm and paintings drew large numbers of Boston and New York artists to the Conway area. In 1853, Champney married and bought a house between Conway and North Conway. It would be his summer home for over fifty years. His studio was a noted social center, and was visited by many people from all parts of the country. 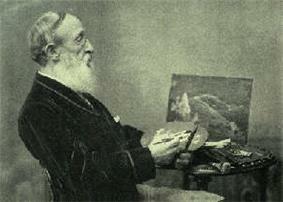 In 1855, Champney became a founder of the Boston Art Club, and, in 1856, its president. On August 4, 1888, The White Mountain Echo reported: "Champney's studio is as much visited as ever this summer, and there are many new pictures to see. Of the landscapes, there is a view from the new carriage road up Humphrey's Ledge that is beautiful, and another a scene in Crawford Notch, and still another, a picture of Mount Chocorua from Tamworth; there are some lovely new flower pieces ... But perhaps the very prettiest is the old-fashioned pitcher in the kitchen window ..."
In 1900, he published an autobiography, Sixty Years' Memories of Art and Artists. Champney died in Woburn, Massachusetts on December 11, 1907. 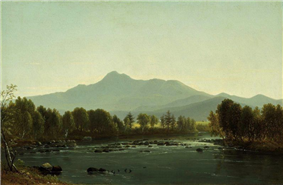 Examples of his paintings can be viewed today at the New Hampshire Historical Society in Concord, New Hampshire the Currier Museum of Art in Manchester, New Hampshire and the Museum of the White Mountains at Plymouth State University in Plymouth, New Hampshire. In recognition of his unique and lasting contribution to the arts and culture of Boston, a gaslit cobblestone alley is named in his honor in the historic Beacon Hill neighborhood of Boston. 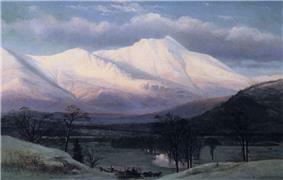 ^ "Mt Washington from Sunset Hill"
Beauty Caught and Kept: Benjamin Champney in the White Mountains. Historical New Hampshire, Vol. 51, Nos. 3&4, Fall/Winter 1996. Campbell, Catherine H. New Hampshire Scenery, Canaan, NH: Phoenix Publishing, 1985. Champney, Benjamin. Sixty Years' Memories of Art and Artists, Woburn, MA: Wallace & Andrews, 1900.